Southampton striker Jay Rodriguez will miss the World Cup after rupturing his anterior cruciate knee ligament. The 24-year-old had hoped to be part of the England squad in Brazil after winning his first cap last year. But he will now have surgery to repair the injury sustained in the defeat at Manchester City on Saturday and is expected to be out until October. 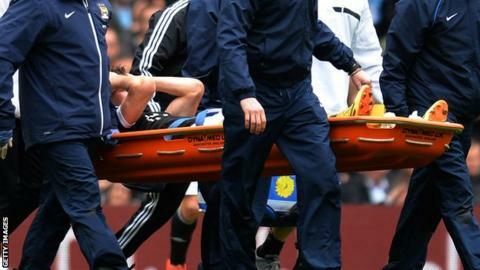 "Everything will be done to deliver a speedy recovery," said Southampton director Les Reed. "Jay is naturally disappointed, but is determined to get back playing for Saints as soon as possible. "He has asked us to pass on his gratitude to everybody who has shown him their concern and sympathy during the 48 or so hours since his injury." The former Burnley striker made his first, and so far only, senior England appearance in a friendly against Chile last November. He has 17 goals in 45 appearances in all competitions for Southampton this season. Who will be in England's World Cup squad? Read more on World Cup 2014: Who is on the England plane to Brazil?